Editor’s Note: By now you know the drill. I turn 40 on June 6, 2012. As a little challenge to myself, I’m spending the next year writing 40 posts that say something about my life. In this one, I focus on one sad truth. I was the last guy picked on almost every single team. Baseball. Whiffleball. Dodgeball. Solitaire. Nobody wanted me. Well – it’s nice to know that I can laugh about it now. Almost 40 years on this Earth and probably a good two decades removed from when any semblance of athletic ability should have kicked in, I can finally come clean. I am woefully inadequate when it comes to feats of strength, sport or conditioning. There’s a reason we don’t celebrate Festivus in this house and it has nothing to do with lack of grievances. Now, none of this is a surprise to anyone who knew me way back when I was young. Gawky and awkward, I was as gawkward as they come. Hey – some people are born to run. Others sit out in right field and pray that every seeing-eye tracer shot doesn’t find its way anywhere near your mitt. Which of course, they do. Even balls that didn’t originate on your field of play. How else do you explain Sputnik landing upside my noggin? The thing is – I WANTED TO BE GOOD. More importantly – I WANTED TO PLAY!!! I didn’t even care if I was picked last although that happened so many times, I stopped counting and started contacting locale consulates determined to import a fresh crop of exchange students to improve my standing on the depth chart.Why they kept coming from the steroid-crazed Soviet bloc, I have no idea. The best laid plans… right?!?!? But there was some disconnect in me that prevented me from connecting bat to ball. I’m sure some part of it was fear. When I was a kid, I was cautious. Mean dogs always found their way to my side of the street and on one unfortunate Saturday morning, a whole pack of crazed canines cornered me on a neighbor’s stoop as I delivered his paper. In fact, my entire route was seemingly designed to kill me or make me stronger – with the highlight being this one house that abutted a junkyard guarded by two fur-jacketed switchblades. The owner never paid on time and his wife always directed me to the garage guarded by Cerberus and Erebus to shake down her hubby. Most weeks, I just paid for the guy’s papers out of my own pocket. Call it a small price to pay for precious life. The same held true for the ball field. I wanted to make diving, leaping, wall-climbing grabs but even out in right field where most people die of boredom tending that real-estate, every errant pop fly found its way to my domain. And I ALWAYS misjudged the ball. It’s as if my brain wanted to see me on YouTube. Anything for those 15 Minutes of Fame. Well guess what brain. Al Gore wouldn’t invent the Internet for another 10 years so who’s the sucker now?!?!?!? Eventually, when I got to college and added a little more meat to my bones, I started to develop a little ability. Not enough to merit all states but certainly enough to keep me on the intramural softball roster. It helped that I formed the team. Yup, I had a pulse, a glove, cleats, an average swing and could drink beer. At UMASS, that made me a five-tool player. In Massachusetts, it made me Senator. Now, I still couldn’t go yard but I connected solidly on enough occasions to stay on the team. Better late than never. The only time any real ability ever manifested itself was in those early days following the birth of Colin. A colicky child, he could only be soothed by rhythmic rocking so anytime we went out, we would place him in his car carrier if he got restless and I would sway it back and forth. All told, the entire bundle probably weighed 25 pounds and after one afternoon, waiting in the Verizon store for an hour to procure new phones, my arms were officially pumped and jacked. The next day, in a friendly softball match, I hit a couple of rockets out of the park. That was enough to land me a starting spot on the Tampa Bay rotation until my asking price of gas money shot their season’s payroll and I was right back where I started. Now that Colin is out and about, carried forth on his own speed, my arms Zeus and Apollo have come crashing back down to mortal Earth. I needed a new pursuit and sitting around playing with my Wii all day wasn’t good for anybody. So, it was golf where I figured I could somehow find my true talent. After all – I had been a natural on the mini-golf circuit; keeping solid pace with my buddy Sean from Summer to Summer whittling that handicap as we threaded the windmill at Pirate’s Cove. That gave my short game a decent edge, presuming Granite Links installed a tiny dino at the cup’s edge. If not, I’d just pretend he was there in order to maintain the mental edge. While in college, each year I made a point to take one of those easy one-credit electives in order to maintain some form of a fitness routine. One year it was ‘Jogging 101’ where I apparently proved so adept at ‘showing up and jogging around the track for 45-minutes’ (as the course guide defined the class) that I was offered the position of ‘Jogging 101 Instructor’ the following year. The Jogging Instructor was called upon to show up, jog AND take attendance and at that point in my collegiate career, I wasn’t ready for so much responsibility so I politely declined. The next year, I signed up for another course and this time, I wanted to hit the links. I’d always been taken by golf courses. Prior to college, I had been on them a handful of times and just found myself swept away by their pastoral beauty. A nice day under a brilliant blue sky stepping lightly upon an emerald carpet just had that soothing, transporting effect we crave so often in this life. So, I wanted to be taught the tools that would guarantee me entrance beyond the velvet ropes. And I looked good in plaid shorts. Of course, the Golf 101 Dude was cut from the same mold as the Jogging 101 chick. He carried a clip board, muttered a few things about this being a gentleman’s game (less we confuse it with the folly of Philistines – football) and then slapped a bucket of balls and a 9-Iron before me. What sage advice would he impart before I set out on the Greatest Game Never Played? And with that, I would spend 45-minutes every other day, ridding the campus of its lush green grass. With no instruction, my swing was less pendulum and more pandemonium. Every once in awhile my club would grab hold of the ball and squirt a few inches of forward progress but what’s that they say about a thousand monkeys hammering away at a thousand typewriters? Eventually I was bound to write War & Peace with my divots. So – I let my golf game lapse until a few years after graduation, I ran into my Uncle (my Dad’s bro) at a family cookout. He was talking about how he doesn’t get out to golf near as much as he would like to and I let him know that I had been angling to get back in the game as well. Both of us coming at this from different points of skill. If he was Pebble Beach, I was Rock Bottom. I hemmed and hawed and offered up the best “Awe Shucks” I could muster. “Maybe next time, mister” but he waved that off. “Your dad has clubs. You can use his.” My Dad was right there and offered me the sticks. Now all I needed to do was bring the fire. That night, I panicked. I needed to go from dumb mug to Tin Cup in less than 10 hours. The Yellow Pages were woefully short on golf pros so I did the next best thing. 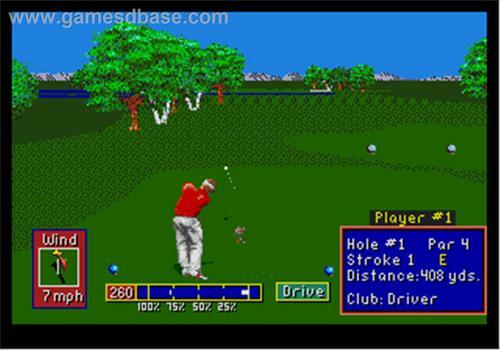 I fired up my PC copy of PGA Tour ’94 and watched Lee Travino slice through his digitized motions – aiming to mimic his moves. Bear in mind – this isn’t the ‘so real – you are there’ golf games we currently enjoy. This Lee Travino-shaped mass of pixels was a good deal lower on the evolutionary chart than those limbless Mii’s in Wii Golf. Whatever. I needed a golf instructor and this was the best I had to work with. The next day, my Uncle picked me up and we headed over to the Rockland Golf Course. We went in, grabbed a tee-time, a cart and got ready to head out. Suddenly, we heard a voice from behind us. This had to be some sort of sting operation. Fool me once… shame on you. Fool me twice? Fortunately my Uncle spoke the lingo and knew this guy was just angling to join up with us. “Sure. Climb aboard.” So this dude – a greying doctor who was determined to keep stale stereotypes alive – jumped aboard and decided he would be my personal caddie and trainer for the day. Here’s an important note. At the beginning of the day, I took an inventory of the bag and found I had a full compliment of clubs and three sleeves of balls. Added to that were a handful or tees and one ball that was completely different from the others. On it was printed ‘Ed’. This was not a sign that I stood before the greatest game of golf that any one man could ever wage. Nope – my Dad gifted me his name and thus this was his ball. But not any ball. This was his Rosebud. His Excalibur. His ‘lightning bat’ or whatever that splendid splinter Roy Hobbs swung in The Natural was called. I’m too lazy to Google It. Let’s just call it Swingy. This ball took on mythic status in my mind. Here was a ball that my Dad had retrieved from a cup during the greatest round of his life. There, on the 18th hole, as he went to fetch his ball – he found two in its place. The ball he had putted in and a companion – marked ‘Ed’. It wasn’t his. Surely it was a sign from the Golf Gods that he was on to great things. Either that or he found a cool novelty shop that could print your name on anything not nailed down. But I like to go with the story of legend. Either way, I made a mental pact with myself. No matter what happened today – I would not use nor lose that ball. It was special and was not meant for the mealy mitts of mere mortals like myself. The second promise was to temper the alliteration for fear my High School English teacher would track me down and vex my vocab. So – the band played on and we made our way from hole to hole. With 18 before us and 10 balls in my bag, I figured the odds were pretty good that I could make the full course with enough left over to spare. Famous last words. At every other hole I lost a ball. First there was the prerequisite rough. That ball hit some shrubs. I entered looking for it. I exited with a 90% chance of Lyme disease. On the 8th hole, I ran into a gaggle of geese who had feathered their nest on the fairway. “Steer clear of the geese”, my Uncle warned. He should have just painted a bulls-eye on them as that’s exactly where I dropped the ball, despite the fact that my back was turned to them and I was swinging a full 180-degrees in the opposite direction. So, they adopted my orb and I grabbed another from the bag. And at every doghouse, henhouse, outhouse and caddy shack that littered the course, I managed to misplace more and more of my Dad’s treasure trove. Until we got to the 18th hole. The doc came alongside me and told me to fire away. He had long stopped dispensing advice on proper form and function and was now looking up euthanasia laws in Massachusetts. Not sure if that was for me or for him. Or both. Misery loves company. I looked in the bag and saw I had burned through the hole pile of balls. Only one remained. So I grabbed it and choked back fear. I had a mission before me and like the best of sports cinema, I was determined to rise against all odds and sink this one last shot. I would get my slow clap. A Hobbit would play me in the movie. Maybe even Frodo. I dropped the ball. I got in position. I pulled my arms back, twisting my spine, and then cleared the mechanism – letting all sound and distraction drain from the day. There was just me and the ball and somewhere out there – a hole. On my word, I unleashed Hell. My arms swung with clockwork precision slicing through the air a full decade before the Wachowski Brothers would have us believe a Keanu could fly. The club head connected solidly with the ball – grabbing hold and bringing it high up in the sky. The loft was perfect. The velocity primed. That ball flew far, far away. A picture perfect shot marred by one minor detail. I was on the green, putting from maybe 9 yards away. That ball was now many more yards further in a galaxy far, far, away. And though I looked far and wide, I could not find that ball. I like to think it landed somewhere on another hole – rolled into the cup – waiting patiently for the next errant Ed to come around and seize his day. Sometimes it makes me sad, though…That ball being gone. I have to remind myself that some balls aren’t meant to be kept. Their curves are just too tight. And when they fly away, the part of you that knows it was a sin to lock them up in a sleeve DOES rejoice. But still, the place you live in is that much more drab and empty that they’re gone. I guess I just miss my Dad’s ball. Oh well. He’ll get another one. Plenty of balls in the pond, as they say. Especially on that course after I’ve played through. Which brings me to this past weekend, when I finally cashed in the Gift Certificate for golf lessons that Andi and the kids gifted me this past Father’s Day. I trooped down to Thompson, CT to the Raceway Golf Course on a brilliant, blue September Saturday and met with my instructor, David Hall. I told him my tale of woe and he reciprocated with trusting compassion in his eyes. “Don’t you worry. I’ve seen everything”, he said. Good luck with your golf lessons! Go onto it knowing that YOU are an athlete who completed a triathlon!!!! No more last picks for you! Two things. One I think I was the pitcher who gave up those bombs in the friendly softball game. I just assumed you were on the juice! @Chris – Thanks for corroborating my one day of softball glory. You were indeed the pitcher and while I wasn’t on the juice, I can’t completely rule out the fact that I may have been sipping Colin’s formula. Being good doesn’t matter if you are having fun. Good luck with the lessons. Maybe if it sticks on you I will have to do the same so we can play. Maybe get Juice and Ollie for a foursome. Only one lesson. I pick back up next year but this was all about getting a decent swing – or at least – some semblance of a swing. It turns out I’ve been swinging at that little white ball like it was a baseball (topping it most times) and in 45 minutes, with one minor adjustment, I was finally connecting. I’ll practice at the range this Fall and then hopefully play a game in the Spring. I like your foursome idea and I don’t think you need lessons. What this guy showed me – I’m sure Juice and Ollie could do the same for you.